The latest issue of Discourse, the University of Regina's research magazine, features a few familiar faces. SPHERU will be hosting a conversation on healthy aging at Congress 2018. 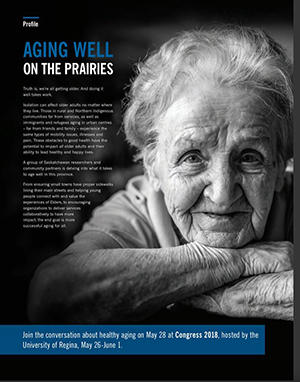 SPHERU will be facilitating a conversation about healthy aging on May 28 at this year's Congress of the Humanities and Social Sciences at the Universtiy of Regina (p. 17). The full page ad explains how social isolation is something that impacts all older adults, no matter the community. SPHERU's event at Congress will dive into what it means to age well in Saskatchewan. The conversation on healthy aging will take place on Monday, May 28 in the RIC atrium from 12 p.m. to 3 p.m.
Novotna received $78,200 from the Saskatchewan Health Research Foundation (SHRF) to develop recommendations to support counsellors in their work. For the full articles, check out the most recent issue of Discourse.